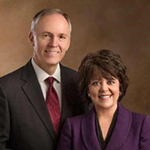 Barre Glade Burgon, 66, and Karen Manning Burgon, five children, Shadow Mountain Ward, Ogden Utah Weber Stake: St. George Temple Visitors’ Center. Brother and Sister Burgon recently served as a senior missionary couple. He is a former stake presidency counselor, high councilor, bishop, ward Young Men president, and missionary in the Northwestern States Mission. Retired lawyer. Born in Salt Lake City to Glade Lynn Burgon and Laura Palmer Burgon. Sister Burgon is a former stake and ward Relief Society president, stake Primary presidency counselor, and ward Young Women and Primary president. Born in Salt Lake City to John Paul Manning and Coy Echo Christensen Manning.